Vases of this design were produced during the Ming and Qing dynasties, although the original form would most likely have been found in bronze from the Han dynasty or earlier. The low relief patterns on the cylinders also suggest an archaistic influence, and in several Qing examples, the mark fanggu, 'imitating antiquity', is inscribed to further accentuate the relation with archaism. The shape of this vase is sometimes known as 'champion's vase', an appellation translated from the Chinese, ying (eagle) and xiong (bear), describing the two beasts represented, but also forming the pun on the word for 'champion' or 'hero'. Alternatively, the vessel is also known as a 'nuptial cup', he jing bei, as it is believed that during the Ming dynasty, it was used as a ritual wine vessel during the wedding ceremony. The double cylinders were filled with wine to be drunk by the bride and groom as part of the marriage rites. 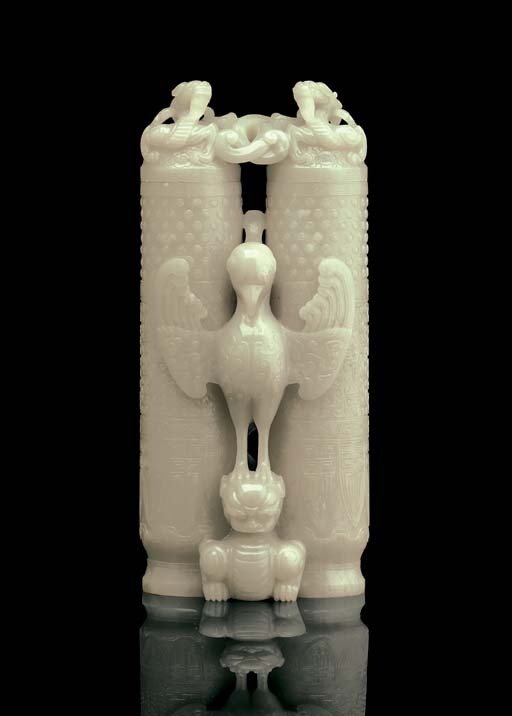 A very similar double-vase with cover from the Victoria and Albert Museum, was included in the Oriental Ceramic Society exhibition, Chinese Jade Throughout the Ages, 1975, and illustrated in the Catalogue, no. 442; another is in the Palace Museum, Beijing, illustrated in Zhongguo Yuqi Quanji, vol. 6, pl. 244; while an example carved from spinach-green jade and bearing a Da Qing Qianlong Fanggu mark, is illustrated in Jadeware (III), The Complete Collection of Treasures of the Palace Museum, 42, Hong Kong, 1995, pl. 151. Compare also two other variations on this vase, both from the Hartman Collection, illustrated by Robert Kleiner, op. cit., 1996, nos. 72 and 77.